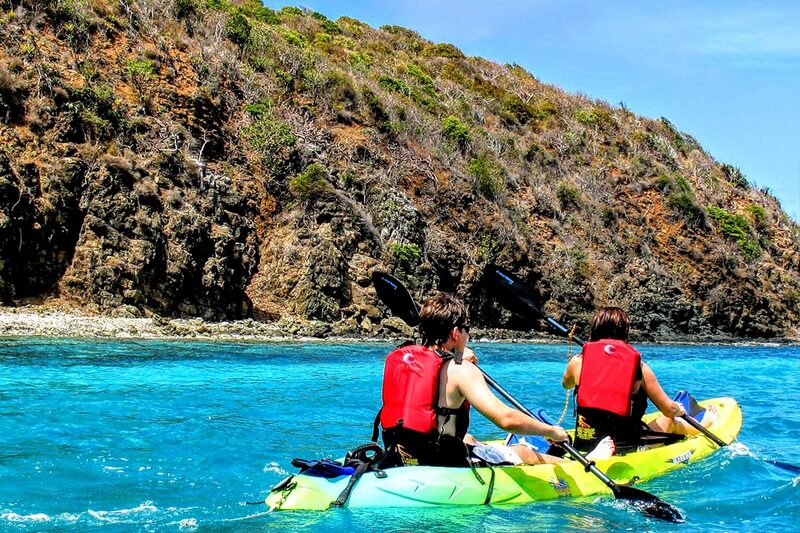 THE CULEBRA ISLAND AQUAFARI IS A KAYAKING, BEACH EXPLORATION AND SNORKELING TOUR YOU’LL NEVER FORGET! Explore the true secrets of Puerto Rico! Our Aquafari is one of our most impressive excursions. Culebra Island is a snorkeler’s paradise. The clearest waters, white sand beaches, and a great variety of sea life. Snorkeling in Culebra has no comparison! Discover why kayaking and snorkeling in Culebra is so unique. Our journey starts at Tamarindo Beach. You will kayak through turquoise water and craggy shorelines to the world-famous Flamenco Beach. Enjoy two snorkeling sessions at the Luis Peña Reserve. 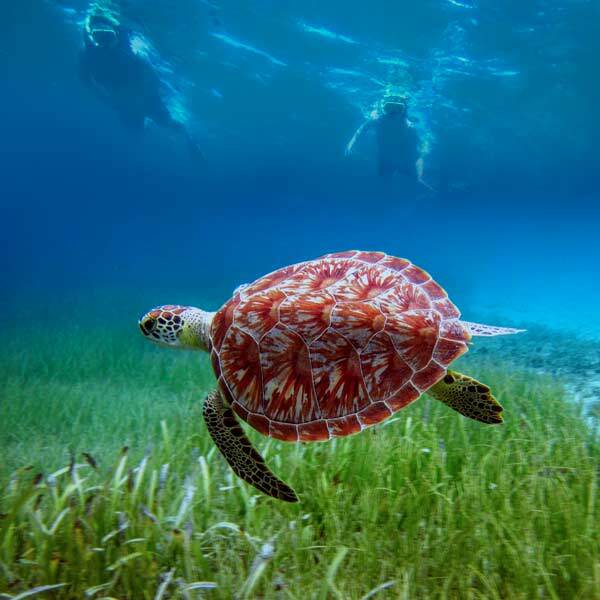 Swim with turtles and snorkel through vibrant coral gardens. Our Cuiebra Aquafari Full Day Trip will be the highlight of your vacation. 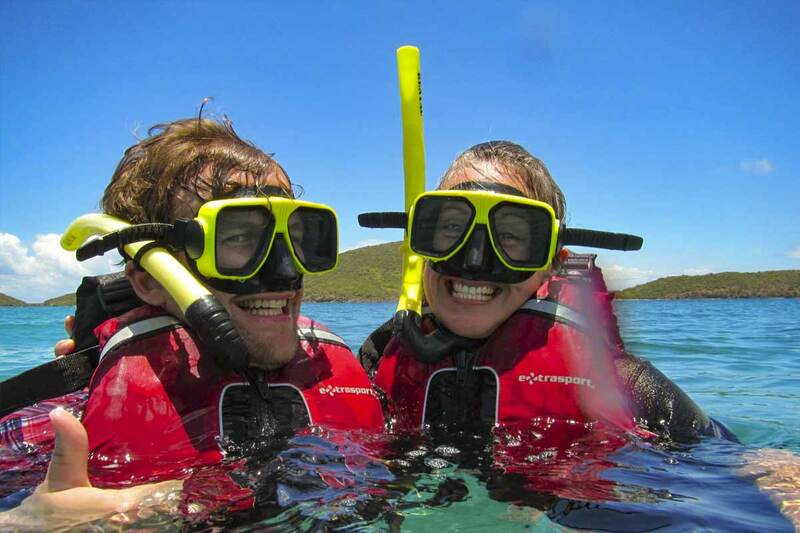 Choose the Culebra snorkeling tour that better fits your needs. If you are on the main island, go with our Culebra Aquafari Full Day Trip. It includes round trip ferry tickets! * For guests staying in Culebra, our Culebra Aquafari Morning Excursions are the best choices. Spend a full day at world-famous Culebra Island. Enjoy the best snorkeling in Culebra. Kayak through paradise at the Luis Peña Marine Reserve. 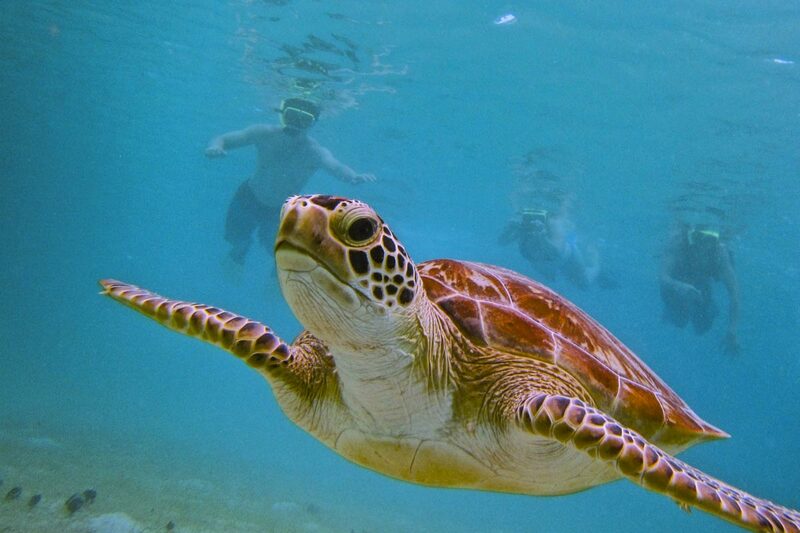 Swim with turtles and vibrant marine wildlife. Explore the delicate ecosystems of the Reserve. Learn the unique history of Culebra Island. Experience the best of Puerto Rico! *The ferry from Ceiba to Culebra is operated by the Puerto Rico Marine Transportation Authority, an agency not affiliated to Kayaking Puerto Rico. **From the Culebra Ferry Terminal to Tamarindo Beach, and back. 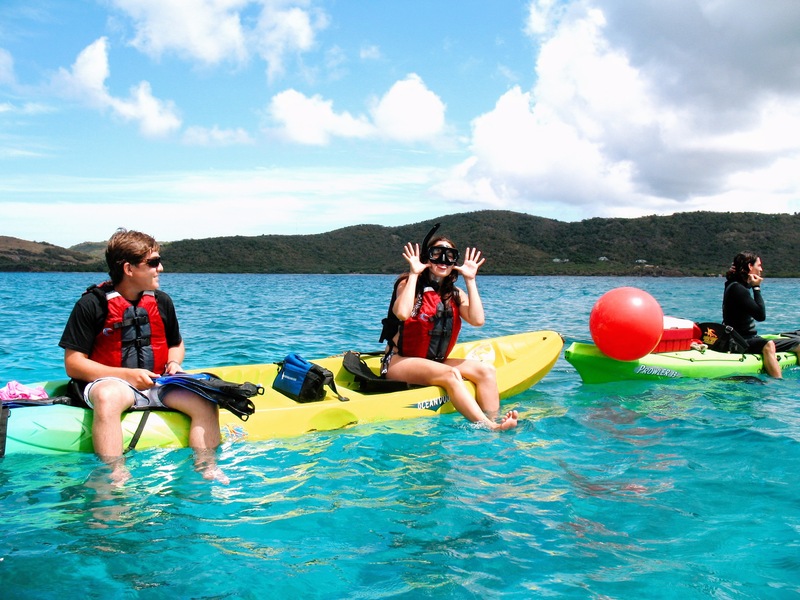 OPTION THREE: AFTERNOON KAYAKING CULEBRA SNORKELING TOUR (12:00 PM) Not available at this time! All our equipment is beginner-friendly. Guests coming from mainland Puerto Rico only. You must be at the Ceiba Ferry Terminal* at 9:30 AM. Our host will meet you there for check-in. Private parking facilities are available around the terminal. Guests already staying in Culebra Island only. You must be at Tamarindo Beach at 7:30 AM for check-in. We do not provide transportation service for this tour. AFTERNOON KAYAKING CULEBRA SNORKELING TOUR: Not available at this time! You must be at Tamarindo Beach at 11:30 AM. *The Ceiba Ferry Terminal and the ferry to Culebra Island is operated by the Puerto Rico Marine Transportation Authority, an agency not affiliated to Kayaking Puerto Rico. 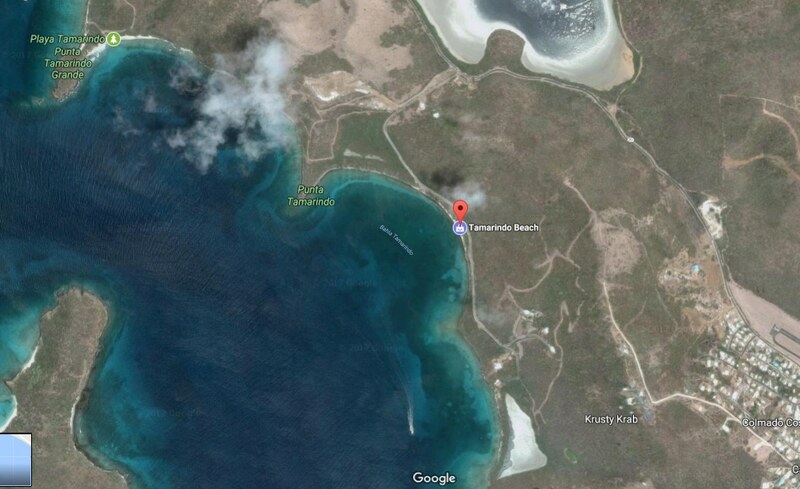 Satellite view of Tamarindo Beach and part of the Luis Peña Reserve in Culebra, Puerto Rico. Click on the image for driving directions to Tamarindo Beach. Guests coming from the main island meet our host at the Ceiba Ferry Terminal. * If you need transportation to the ferry terminal, consider our optional transportation service. After checking-in with our host, we will board the ferry to Culebra. The average travel time is 1 hour and 30 minutes. Sit back, relax, and get ready for the wonderful adventure that awaits! Upon arrival to Culebra, our host will be waiting for you at the Terminal. Then, off we go to Tamarindo Beach! Guests staying in Culebra can join our Morning excursions. 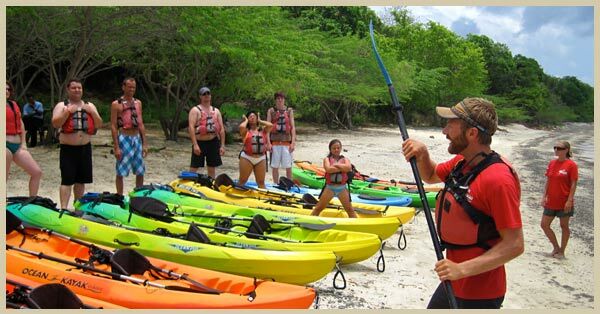 For these excursions, we meet at Tamarindo Beach at 7:30 AM for the Morning session. We do not have transportation service available for these excursions. You must arrange your own transportation and be at Tamarindo Beach at check-in time. Tamarindo Beach is located on the west coast of Culebra. Upon arrival, our eco guides will give you complete pre-ride instructions. Our Aquafari begins with a kayaking excursion through the calm waters of the Luis Peña channel. This is one of the most important marine reserves in Puerto Rico. It has the highest coral cover in the island. Plus, it is the feeding ground of sea turtles! This stunning marine reserve is full of life. Enjoy the breathtaking views along the way: inside and outside of the water! Get ready to explore the underwater marine reserve. 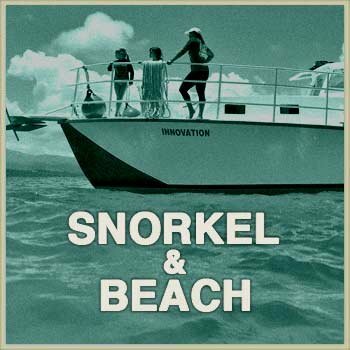 Put on your premium-quality snorkeling gear. Jump off your kayak and dive into the vibrant waters of Culebra. Your eco guides will lead the way. 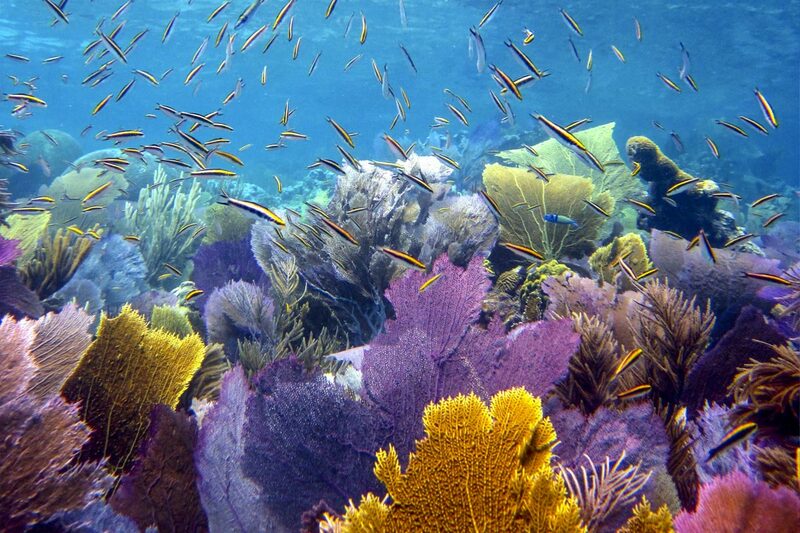 Swim among schools of colorful tropical fish and coral formations. Get ready to spot green sea turtles and hawksbill turtles. There is no other place in Puerto Rico where you can enjoy this experience! WAIT, WE ARE JUST STARTING! Our kayaking excursion continues along the reserve’s craggy shoreline. Watch the coral gardens and the fish below. We will take a relaxing break, complemented by light snacks and cold refreshments. Enjoy the beach’s clear blue water. Our eco guides will share Culebra’s peculiar history and the feeling of the island’s untouched ecosystems. A second snorkeling session follows at a great coral reef near the beach. Back on our kayaks, we will calmly paddle back to Tamarindo Beach. After a quick refreshment, we will head to our last stop: Flamenco Beach. Ranked as the second most beautiful beach in the world, no one should ever leave Culebra without visiting Flamenco! For about one hour and a half, you will be free to enjoy this unique place. Have lunch at one of the local restaurants and kiosks. Later, your KPR guides will take you back to the ferry terminal. There, you will take the trip back to Ceiba Ferry Terminal, while enjoying the views of Puerto Rico’s eastern coast at sunset. *The ferry from Ceiba to Culebra is operated by the Puerto Rico Marine Transportation Authority, an agency not affiliated to Kayaking Puerto Rico. Therefore, we are not responsible nor can control in any way changes or delays in the ferry schedule. Our company promotes a 4:45pm departure from Culebra, in the event we receive tickets for a later departure you will be notified in advance and/or on site. Your group will be offered the option to confirm excursion with a later departure, reschedule to another day, reschedule to another excursion or cancellation with a full refund. Culebra residents and workers have priority boarding. The excursion start time is subject to the arrival time of the ferry to Culebra. 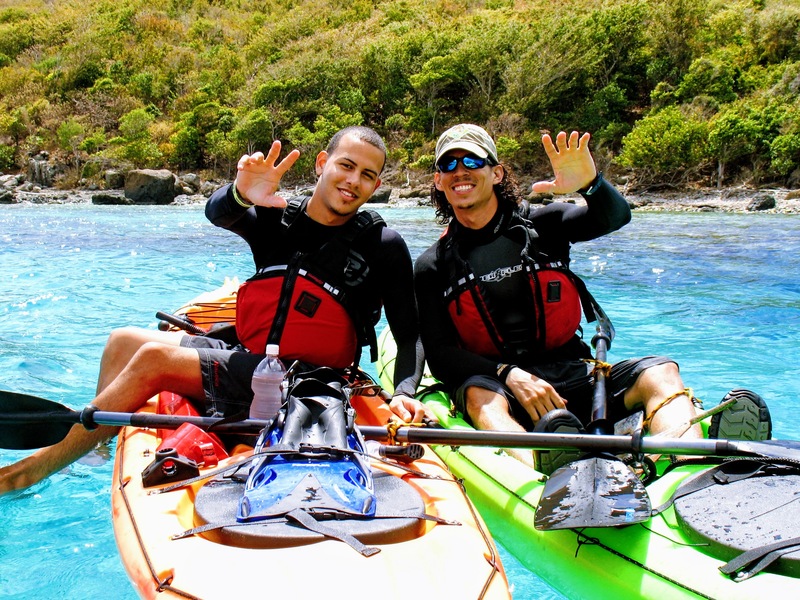 Before heading out on your kayaking and snorkeling in Culebra adventure, our trained guides will teach you all you need to safely explore nature at its best! Kayak through turquoise water, along craggy shorelines. Culebra is a real paradise! 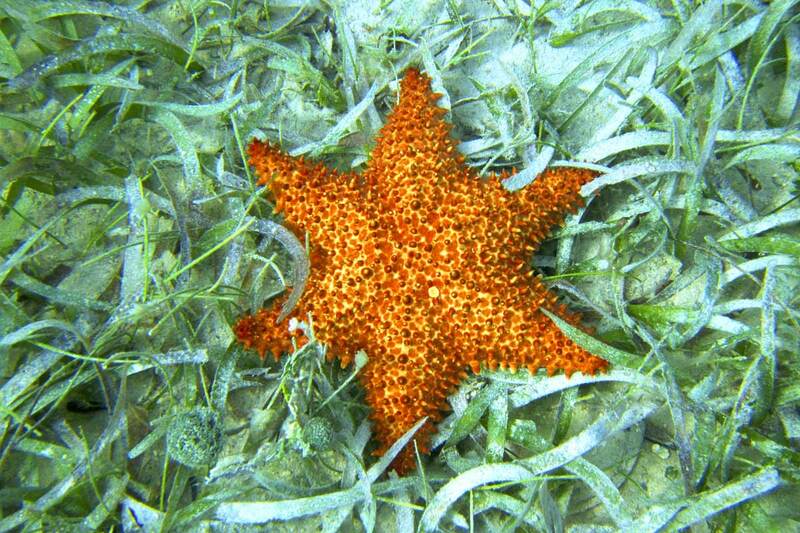 Culebra has the clearest waters, white sand beaches, and a great variety of sea life! In order to be fueled for the day, please eat a hearty breakfast prior to arriving to Ceiba. The Aquafari Culebra Day Trip requires a minimum of 6 guests. We will call you to discuss your options if the minimum is not met. Please notify us ahead of time if you have any physical condition. We do not provide private maritime transportation to Culebra. The tickets included in our $79 Culebra Aquafari are for the public ferry. The Puerto Rico Maritime Transportation Authority (PRMTA) operates this ferry. We are not affiliated to the PRMTA. Therefore, we are not responsible nor can control the ferry schedule in any way. Our company promotes a 4:45pm departure from Culebra, in the event we receive tickets for a later departure you will be notified in advance and/or on site. Your group will be offered the option to confirm excursion with a later departure, reschedule to another day, reschedule to another excursion or cancellation with a full refund. Culebra residents and workers have priority boarding. For this reason, you must be on the Ceiba Ferry Terminal at check-in time. Otherwise, you may miss the ferry. In that case, you will not be able to get to Culebra on time for the tour. Finally, the excursion start time is subject to the arrival time of the ferry to Culebra. Kayaking Puerto Rico does not sell ferry tickets. Do not risk your valuable property. We recommend you to keep it simple! Avoid bringing big SLR and non-waterproof cameras. Eat a hearty breakfast before joining us in the morning. Bring cash for buying food at Flamenco Beach after the trip. Keep in mind that most food kiosks do not accept credit cards. 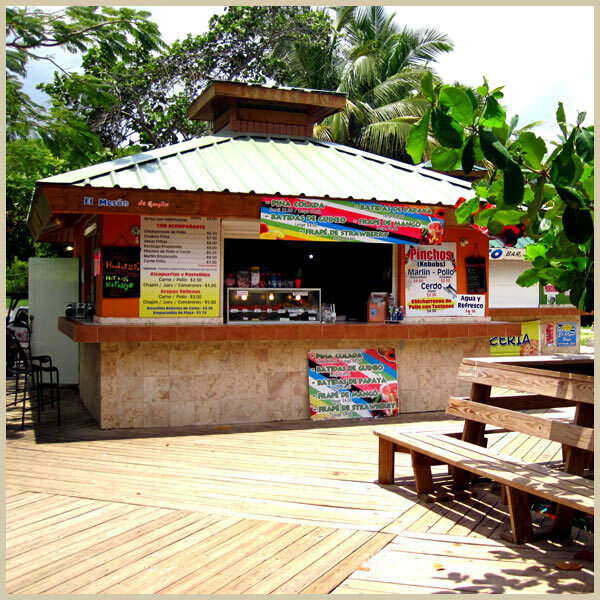 End the day relaxing and dining in one of the many local kiosk serving traditional dishes in Flamenco Beach. Round Trip Transportation is available for $25.00 per person. Simply add it at check out and we will send you the details in your confirmation email! Round Trip Transportation is subject to a minimum of at least seven guests requesting. The seven guests do not have to be from your same party or pick up location, we will combine your reservation with other reservations in efforts to reach the transportation minimum requirement. Guests staying in Culebra Island must have their own transportation to meet at Tamarindo Beach at Check In time. Kayaking Puerto Rico does not provide private maritime transportation to Culebra. The tickets included in our Aquafari Culebra Day Trip are for the public ferry. The Puerto Rico Maritime Transportation Authority (PRMTA) operates this ferry. Kayaking Puerto Rico is not affiliated to the PRMTA. Therefore, we are not responsible nor can control in any way changes or delays in the ferry schedule. Our company promotes a 4:45pm departure from Culebra, in the event we receive tickets for a later departure you will be notified in advance and/or on site. Your group will be offered the option to confirm excursion with a later departure, reschedule to another day, reschedule to another excursion or cancellation with a full refund. Culebra residents and workers have priority boarding. For this reason, you must be on the Ceiba Ferry Terminal at check-in time to avoid missing the ferry. If you miss your ferry, you will not be able to get to Culebra on time for the excursion. The excursion start time is subject to the arrival time of the ferry to Culebra. Incredible views. Great guides. Perfect Service. 100% worth the money!!! We were able to see turtles, sting rays, starfish and the coral reefs! 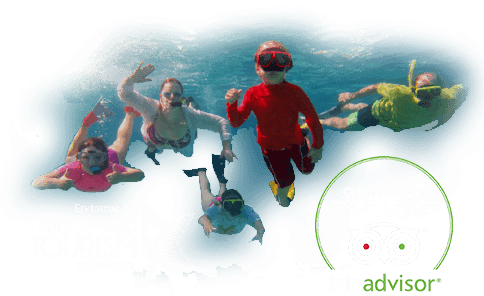 They give you the full experience from snorkeling with turtles, to kayaking and then relaxing on the beautiful Flamenco Beach and eating great food.